Big Law, Start-Up Firm, or Solo Practitioner - Run the Call finds you a trusted and licensed local attorney to provide court coverage when you need it at a price you can afford. 1. Provide the Details - give us the case details, upload any necessary documents, and let us know where and when you need coverage. 2. Get Matched - your request is instantly dispatched to our network of vetted attorneys. 3. 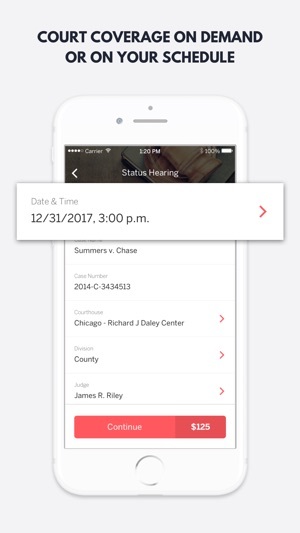 Receive Confirmation -upon completion of your hearing - you will receive a coverage summary, any important files, and if applicable, any upcoming dates scheduled during the hearing. 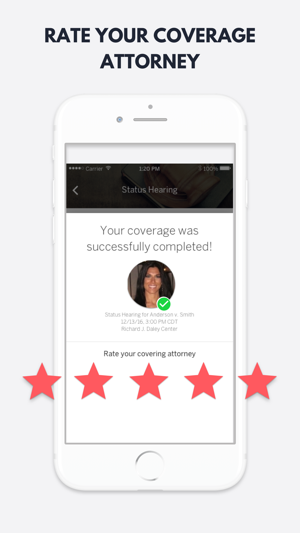 • Convenient - schedule coverage that suits your schedule, whether on demand or in advance. • Access a network of licensed attorneys that have all been screened and vetted by Run the Call. 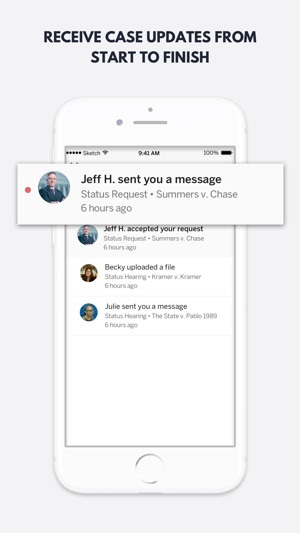 • Easy Communication - stay in the loop with your coverage attorney with our secure, in-app chat feature. • Connect with favorites - upload new files or connect with your favorite cloud storage solutions like Dropbox, Box, and more. We have attorneys all over the state and may still be able to support your coverage request. 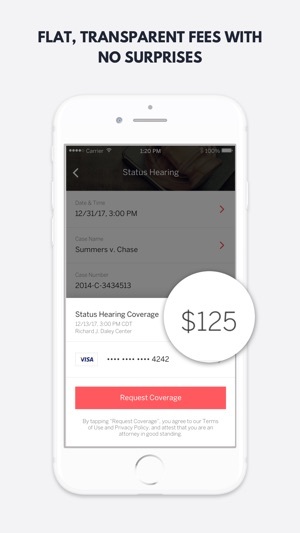 Interested in covering court calls to make extra money? Download and apply from within the app! • Work from the courthouses you want, when you want. 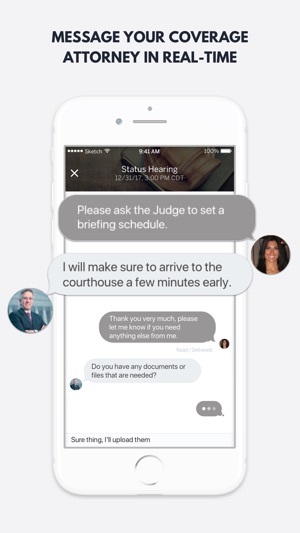 • Once you are approved to cover court calls, we start matching you with incoming coverage requests from other attorneys using Run the Call. I paid $175 for coverage at 26/California. Instead of showing up, the covering “lawyer” called the prosecutor over the phone to get a date. This “lawyer” did not tell my office that he wasn’t physically appearing so my client called complaining at 11:15am, for a 9:30am case, that he was still waiting and nobody had appeared yet! If this would be acceptable to other lawyers needing coverage, then use their service! Otherwise go with “Attorneys on Demand” instead. I wanted to update this review with an excerpt of the email that was sent to you on 9/28/2018. After our conversation yesterday I spent the remainder of the day investigating what we discussed on the phone. - Your next date is 10/5, one of the acceptable dates you listed. - We can understand that reason you were upset is that your client, was upset. - Your client was likely upset because they believed no one was at their hearing as the coverage attorney had attended the hearing telephonically. - While most importantly he did obtain the results you requested, he did not appear in court. Your client was present - which is also a major reason why you requested court coverage using Run the Call. I completely understand why you were upset and frustrated. The attorney who covered your case is copied on this email - he is available to answer any additional questions you have regarding yesterday’s hearing. We don't condone telephonic coverage - the coverage attorney has been admonished and will not be compensated for this hearing. We've also already processed a refund for your payment because coverage was not provided - you should see it sometime shortly. You have been a great customer and you have also provided meaningful feedback and input in the conversations we have had - we want that to continue. We apologize for the inconvenience - we thank you for your patience and consideration while we work through issues like this & as we continue to grow both of our businesses moving forward! Literally saved the day (or case! )- able to seamlessly cover me with little notice. Highly convenient and excellent service saving me a slippery and dangerous commute to a courtroom close to the RTC coverage person. I look forward to utilizing services in the future. Great to have someone cover routine hearings that I’m too busy to attend. © 2015-2018 Run the Call, Inc.